Star anise is an important spicepart for human needs, commonly used as an enhancer of taste, color and aroma of the food.The purpose of this study were to identify the active compounds contained in crude extract star anise and its antimicrobial activity. In this study identified component of extract star anisewas extracted using maceration method for 24 hours. The result showed that the crude extract of star anise had 6 compounds as active compound by UPLC method i.e Orthidine E, Adriadysiolide, 8-Decene-4,6-diyne-1,2,10-triol, Chrysogedone A, Egomaketone, Lepalone. Crude extract of star anise also determined amount of total phenolic content and flavonoid content. Ethanolic extract contained 81.46 ppm of phenolic compound and 16.97 ppm of flavonoid. The crude extract of star anise about 6% concentration had highest antimicrobial activity with inhibition zone around 1.5 cm for the microbe isolated from the spoilage of broiler chicken meat. WINARSIH, Sri et al. IDENTIFIKASI SENYAWA AKTIF CRUDE EKSTRAK BUNGA LAWANG (Illicium verum) DAN UJI ANTIMIKROBIA PEMBUSUK DARI DAGING AYAM BROILER. JURNAL AGROTEKNOLOGI, [S.l. ], v. 12, n. 02, p. 196-202, dec. 2018. ISSN 2502-4906. 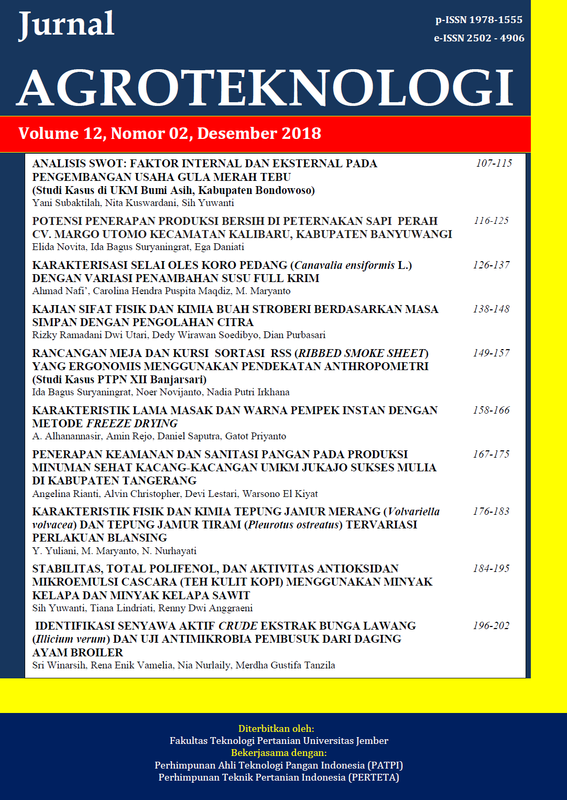 Available at: <https://jurnal.unej.ac.id/index.php/JAGT/article/view/9314>. Date accessed: 23 apr. 2019. doi: https://doi.org/10.19184/j-agt.v12i02.9314.